Astronaut passes hunting heritage on to his family. Charlie Duke puts the crosshairs on a young buck and anticipates the result — a 168-grain, .308 Winchester bullet blasting out of the muzzle at 2,700 feet per second. As he squeezes the trigger, a thought flashes through his mind. He has traveled more than 14 times faster than that bullet —38,800 feet per second, to be exact — when his Apollo 16 spacecraft accelerated into Earth’s gravity just before re-entering the atmosphere. One of only 12 men to walk on the moon, Charlie spent 71 hours on its surface after landing in a lunar module named for Orion, the constellation of a great hunter in Greek mythology. The experience was a defining moment in his life, but not his crowning achievement. That continues to evolve, as on this day, when he shares his passion for the outdoors with his son and grandson. It keeps him down to earth. His father, Charles Duke Sr., didn’t hunt. But Charles Sr. taught Charlie and his twin brother, Bill, to target-shoot at age 10. Three years later, he gave them a 20-gauge, double-barreled shotgun, and told them, “Y’all take turns,” Charlie recalls. Growing up in the country near Lancaster, S.C., the youngsters hunted rabbits and bobwhite quail. “We just fell in love with the outdoors,” he says. Later, Charlie also became enamored with flying, setting his sights on being a fighter jock. He scored a bull’s-eye in that pursuit. He served as an Air Force fighter-interceptor pilot during the Cold War at Ramstein Air Base in West Germany and later became a test pilot at Edwards Air Force Base in California. In 1965, he volunteered to be an astronaut and moved to Houston with his wife, Dotty, and their first son, Charles Duke III. The moon was his next target. The following years were filled with training, the birth of a second son, Tom, and intimate involvement with five Apollo flights, including serving as spacecraft communicator for Neil Armstrong’s landmark Apollo 11 lunar landing. He was invited on hunting and fishing trips around the nation. Charlie and Dotty shot their first white-tailed deer near San Saba. The couple loved to camp, hike, hunt and fish. “On the first survival training, there were four or five of us astronauts, and none of them had a clue about the outdoors,” Charlie says.“They didn’t know how to field-dress a rabbit or skin it. So I did all that and roasted it. Charlie Duke walked on the moon in 1972. On April 16, 1972, Charlie, commander John Young and command module pilot Ken Mattingly lifted off from Kennedy Space Center on Apollo 16 for a 240,000-mile journey to the Descartes highlands of the moon. 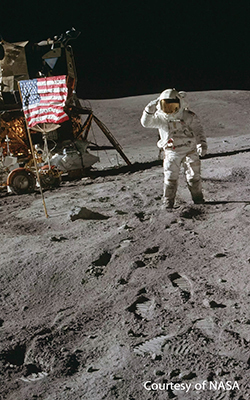 Duke and Young conducted three moonwalks and drove the lunar rover nearly 17 miles. The outdoorsman did not forget to pack his humor. One assignment was to collect soil from a shadow. He found the perfect sample in a hole underneath a rock, Charlie recalls in his autobiography Moonwalker, co-written with Dotty. In 1975, he left NASA, joined the Air Force reserves and moved to New Braunfels to pursue business opportunities. He joined a deer lease near Canyon Lake, about 15 minutes from home. Son Charles was 11 when he shot his first buck. Son Tom got his at age 10. Rearing their own families now, the men share their father’s enthusiasm for the outdoors with their children. Charles, 50, a business consultant/strategic planner with the CPA firm Elliott Davis Decosimo in Greenville, S.C., has six children. He bought some land, improved the duck ponds and planted food plots for deer and doves. Charles’ oldest sons, Charles IV and Haywood, took their first deer at Charlie’s deer lease. His stepdaughter hunts, too. Tom, 48, a retired colonel with the Texas Air National Guard and a Delta Air Lines pilot, lives in Terrell Hills, a San Antonio suburb. His son Parker, 15, also shot his first buck at the deer lease. His other two sons have yet to pick up hunting, but they enjoy fishing and the outdoors with their father and grandparents. “Hunting has been a real bond for our family, with our kids and older grandkids,” says Charlie, who turns 80 this October and travels the world doing motivational speaking and Christian ministry. This year, Charlie and Dotty spent one cold, drizzly Friday afternoon in January in a tower blind so tall that he said he needed an oxygen mask. Tom and Parker arrived at the Black Ranch in Maverick County in Southwest Texas later that day, just in time for dinner. It was far from a typical deer camp meal — or conversation. The hosts were the Hasslocher family — patriarch G. “Jim” Hasslocher, 92, who is the founder of Jim’s Restaurants and Magic Time Machine restaurants; Jim’s wife, Lilia; his son, Bobby; Bobby’s wife, Jill; and Bobby’s son, Robert, 31. Gary Johnson, a general manager with the restaurants, and his wife, Cori, prepared a feast of fried shrimp, oysters and trout, and grilled mahi-mahi. The conversation included discussion of the spectacular views of Earth from the moon, the difficulty of moving in a spacesuit, manned missions to Mars, ion drives and the future of spaceflight. The next day, the Hasslochers planned the morning hunt. “If you see something that you want to shoot, there are some 12- to 14-point bucks that come in there. Try to take one,” Hasslocher says. Dotty says that Charlie processes his own deer. 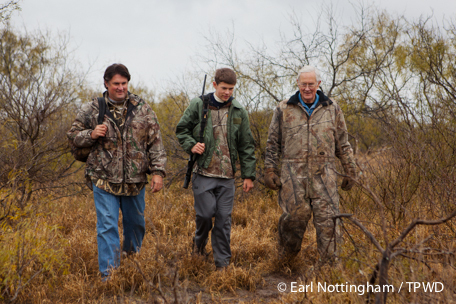 Charlie Duke hunts with son Tom and grandson Parker at a ranch in Southwest Texas. Charlie settles into his blind. When the feeders go off just after daylight, a swarm of deer emerge from the brush and mesquite — does, fawns, young bucks and some older bucks, including a massive eight-point. After about an hour, Charlie hears a report. A text from Tom says he thinks Parker got a big 10-point but they’ll wait before looking. Not long after, Charlie lines up his crosshairs on a four-point and drops him. Another text appears, this time with a photo of a 12-point buck. “Man, that’s a monster,” Charlie says. The hunt is over, but the sharing of stories begins as the hunters collect the harvest. Parker is still excited when he tells his grandfather about the other bucks they had seen and how his father advised him to be patient. “That’s the best I ever shot,” Parker says. “That’s the biggest thing I’ve ever seen,” Tom adds. Growing up near the deer lease allowed Tom and Charles plenty of chances to share time camping, fishing, hunting and learning with their parents. Tom says his father showed him how to clean his first deer, hang it in the garage and butcher it. “He taught me to respect the animals,” he says. “Dad always said if you shoot something, you eat it. Tom passes what he learned on to his sons, whether it’s simply tying a hook on a line or preparing gear for hunting, fishing or camping. “Definitely the experiences I have had flow through me to my sons. Not one specific moment, but the collectiveness of all the things I learned over the years,” Tom says. Tom says he thinks of his father every time he looks up at the moon. Parker quickly cites the top three things he has learned from his father — respect for the animal (whether a deer or a bass), firearm safety and how to bait a hook. It was his grandfather, however, who made him a sharpshooter. 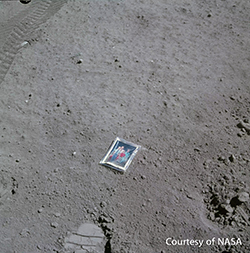 Charlie Duke left a photo of his family on the moon. He says he used to take it for granted that his grandfather walked on the moon. But as he grew older, a broader outlook developed. He enjoys being outdoors and getting away from schoolwork and cellphone service. When he has children someday, he plans to continue the family tradition. Charlie still feels a sense of wonderment when he sees the moon, whether he is sitting in a deer blind with Dotty or just enjoying the outdoors with his grandchildren. “I’ve really been there, and I can see some of the general area of my landing site,” Charlie says. In quiet moments, he sometimes thinks about different aspects of the adventure, such as the re-entry. “Faster than a speeding bullet, just like Superman. I’ve done that,” he says. He believes his longer-lasting achievement, though, is instilling a love of the outdoors in two generations of Dukes — and counting.